Emma played an influential role during Cnut’s reign, survived him and remained a formidable force in English politics until her own death in 1052. This alone makes her a fascinating figure, unique in being the queen of two very different kings of England and mother of two more. Just as remarkable is that she also commissioned her own history of the events she had lived through, making her perhaps the first woman in England to participate so actively in the writing of history. Read the rest here. 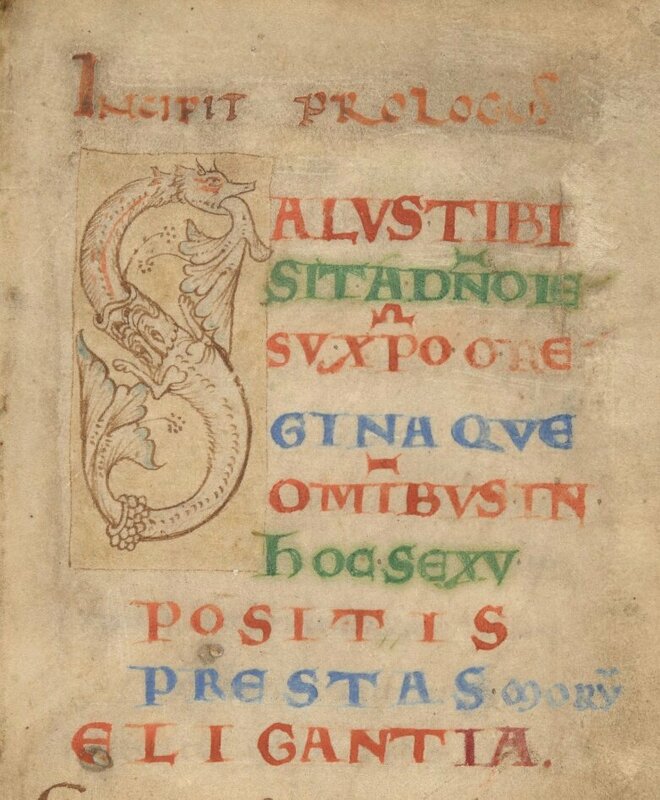 The manuscript of the Encomium which contains the frontispiece of Emma and her sons, and the gorgeous dragon initial above, can be viewed online in its entirety on the British Library website. 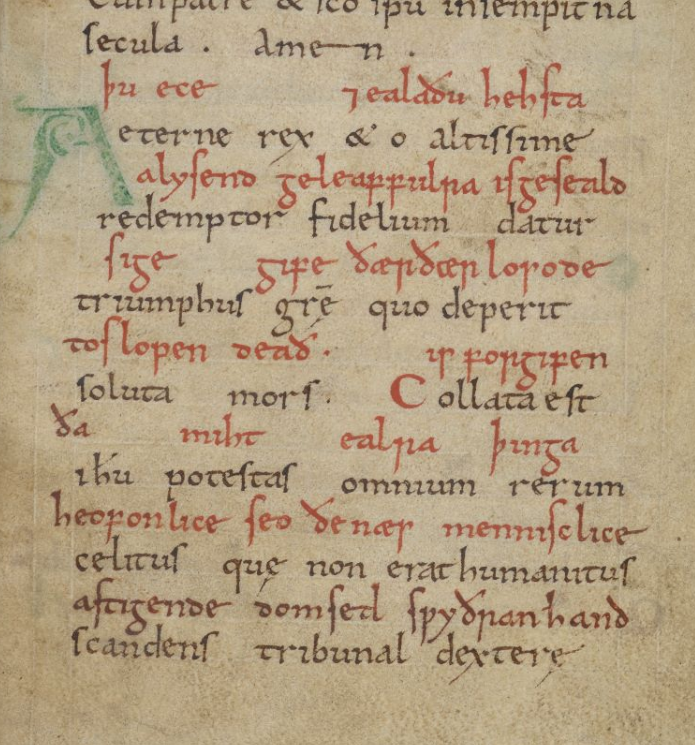 On the subject of the Ascension, here's a fourteenth-century English version of the Ascension hymn 'Aeterne rex altissime', by the Franciscan friar William Herebert. And gyven ys ous the overe hond of graces findinge. Havest, Jesu, fonge mythte that never shaft ne fond. To thee shullen bouwen hem and benden here knen. For flesh sunneth and flesh beteth and flesh ys God regninge. And al thys wordles joye hast in forhowyng. And oure hertes rer to thee thorouh thy grete grace. From the pyne of helle, Jesu, thou ous yeme. And yeld the lorene crounes, God we to thee reme. Wyth the Fader and Holy Gost, ever boute misse. Amen. Hast, Jesu, received power such as created things never had. To thee shall bow and bend the knee. For flesh sins and flesh atones and flesh is God reigning. And all this world's joy hast in thy guarding. And our hearts raise up to thee through thy great grace. And restore our lost crowns, God, we cry to thee. With the Father and Holy Ghost, ever without end. Amen. Herebert has added to his source a lovely phrase in the second-to-last line: 'Loverd that bove the sterre steye...' I discussed the verb steye in my last post about Herebert, where I talked about it meaning 'ascend' but with connotations of active, powerful movement (like mounting horses and climbing trees), and I said it's a verb which connects Good Friday (when Christ 'steye' upon the cross) and the Ascension. And so it does here, alliteratively: Christ steye above the stars. 'ferlich' is a difficult word to translate into Modern English; it suggests something marvellous and wonderful (in the literal sense of 'causing wonder'), but also terrible and strange. 'Blowing beme' literally refers to blasting trumpets but also evokes rushing winds and beams of light - a world-shaking image of an apocalyptic sky. 'The achieve of, the mastery of the thing.' 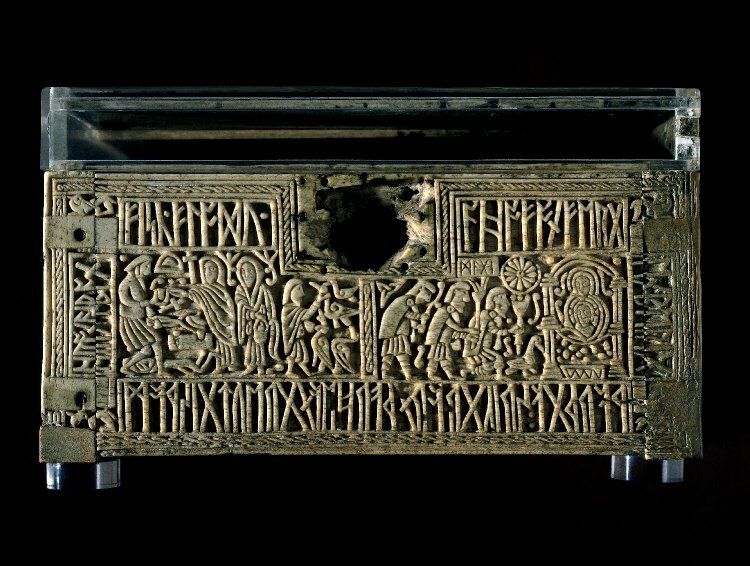 On Ascension Day, I happened to find myself reading about another legendary hero who 'took to flight': Weland, the great smith of Anglo-Saxon and Norse legend. 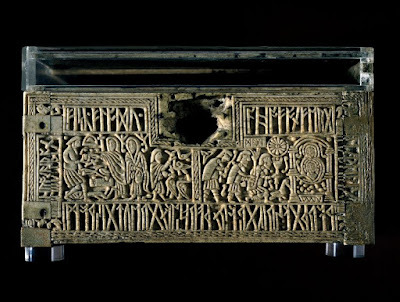 The story of Weland seems to have been widely known in Anglo-Saxon England, and he is referenced in several Old English poems. He is a fierce, frightening figure, but one of great skill and power, the forger of legendary swords and armour. One of the most famous moments in his legend tells how he was captured and imprisoned on an island, forced to work for his captor, but escaped by making for himself a suit of wings and flying away to freedom. 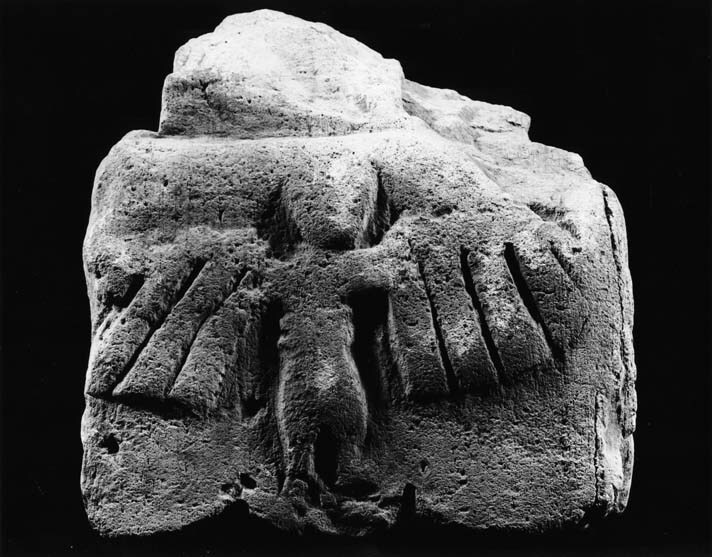 A number of stone carvings from northern England, probably dating from the ninth to tenth centuries, appear to show Weland in his feather-suit. There are birds in both scenes; on the left-hand side, birds are being strangled so that Weland can make his wings from their feathers. Does this juxtaposition suggest a contrast or a parallel between Weland and Christ, a focus on how they are alike, or how they are different? No one can answer that for sure, though it's often noted that in Old English Christ, like Weland, is sometimes called a 'smith' or a 'smith's son' (because he was a carpenter). The juxtaposition brings out the common mythic element in both stories - the man human and yet more than human, skilful and of fearsome power, a creature of the skies as well as of the earth. To a modern eye, seeing a very well-known Biblical story in the context of Weland's strange and disturbing tale makes the familiar suddenly unfamiliar, marvellous, in the sense of something too powerful and terrible to comprehend - what Herebert calls ferlich. The idea that gods dwell in the heights, in the sky and on the mountains, is one of the most ancient religious impulses. It's hardly difficult to see a connection between that and Christ's Ascension, and going on about 'rockets, haha!' feels like a deliberate attempt not to see it. Those silly people of the olden days found poetry in the feast rather more easily than their clever modern descendants do: in Ascension Day folklore there was 'a strong connection between the day and all things pertaining to the sky, such as clouds, rain, and birds' (Roud). Rain which fell on Ascension Day was said to be blessed - 'neither eaves' drip nor tree-drip, but straight from the sky'. The day was connected with holy water in other ways, including the custom of well-dressing and visiting sacred springs. This expresses a sense that the heavens and the earth are interconnected at the most essential level - as of course they are, whether you think of that power as physical or spiritual or both. The kind of preacher who apologises for Ascension Day is likely to call that faith superstitious, but it's infinitely grander, really, than a worldview which finds no wonder in the heavens. We are earthbound, tied to this sublunary world and its many sorrows - but this is one day when the imagination can soar to the sky. 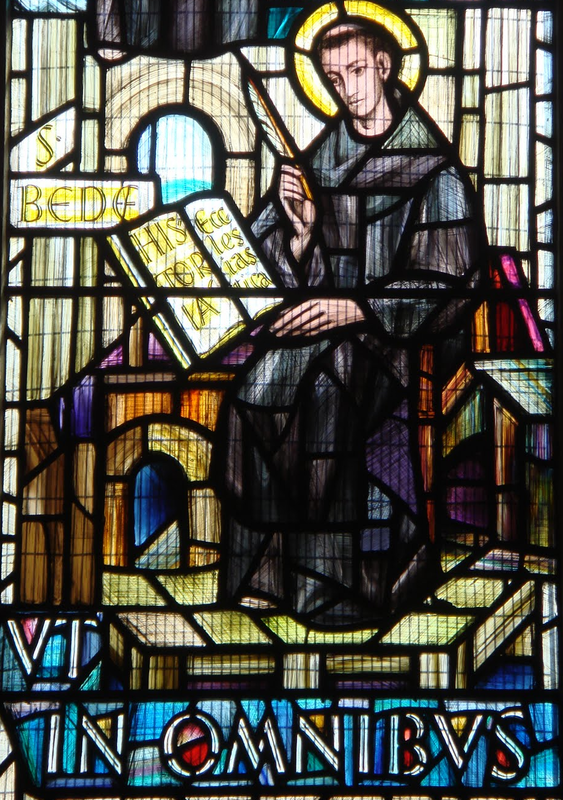 Today is the feast of the Ascension, and it is also the feast of Bede, Anglo-Saxon England's greatest scholar and historian. 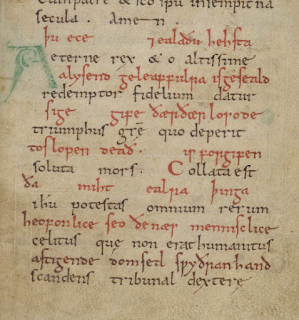 Bede died on Ascension Day in 735, which that year fell on 26 May. 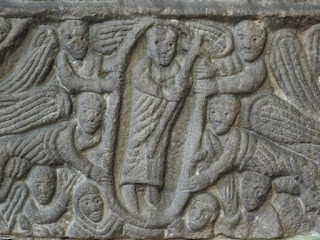 His feast is usually celebrated on 25 May (to avoid a clash with the feast of St Augustine of Canterbury, who also died on the 26th), which means that today, for once, it falls at the very same moment in the church's year as it did in 735. This is a lovely coincidence (or occasional mercy, rather) because the feast of the Ascension and the words of its liturgy were in Bede's mind, and on his lips, as he lay dying. 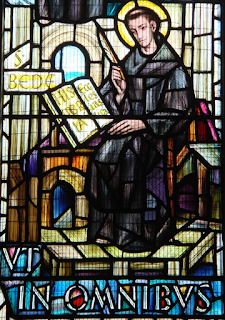 We know this because a moving account of Bede's death was recorded by a monk named Cuthbert, a former pupil of Bede's and later abbot of Wearmouth-Jarrow. Cuthbert was present at Bede's deathbed, and this is how he describes his death. For nearly a fortnight before the Feast of our Lord's Resurrection he was troubled by weakness and breathed with great difficulty, although he suffered little pain. Thenceforward until Ascension Day he remained cheerful and happy, giving thanks to God each hour day and night. He gave daily lessons to us his students, and spent the rest of the day in singing the psalms so far as his strength allowed. He passed the whole night in joyful prayer and thanksgiving to God, except when slumber overcame him; but directly he awoke, he continued to meditate on spiritual themes, and never failed to thank God with hands outstretched. I can truthfully affirm that I have never seen or heard of anyone who gave thanks so unceasingly to the living God as he. O truly blessed man! He used to repeat the saying of the holy Apostle Paul, 'It is a fearful thing to fall into the hands of the living God', and many other sayings from holy scripture, and in this manner he used to arouse our souls by the consideration of our last hour. Being well-versed in our native songs, he described to us the dread departure of the soul from the body by a verse in our own tongue, which translated means: 'Before setting forth on that inevitable journey, none is wiser than the man who considers - before his soul departs hence - what good or evil he has done, and what judgement his soul will receive after its passing'. During these days, in addition to the daily instruction that he gave us and his recitation of the psalter, he was working to complete two books worthy of mention. For he translated the Gospel of Saint John into our own language for the benefit of the Church of God as far as the words 'but what are these among so many'. He also made some extracts from the works of Bishop Isidore... On the Tuesday before our Lord's Ascension his breathing became increasingly laboured, and his feet began to swell. Despite this he continued cheerfully to teach and dictate all day, saying from time to time, 'Learn quickly. I do not know how long I can continue, for my Lord may call me in a short while.' It seemed to us that he might well be aware of the time of his departure, and he spent that night without sleeping, giving thanks to God. When dawn broke on Wednesday, he told us to write diligently what we had begun, and we did this until Terce. After Terce we walked in procession with the relics of the saints as the custom of the day required, but one of us remained with him, who said, 'There is still one chapter missing in the book that you have been dictating; but it seems hard that I should trouble you any further.' 'It is no trouble,' he answered: 'Take your pen and sharpen it, and write quickly.' And he did so. He also told us many other edifying things, and passed his last day happily until evening. Then the same lad, named Wilbert, said again: 'Dear master, there is one sentence still unfinished.' 'Very well,' he replied: 'write it down.' After a short while the lad said, 'Now it is finished.' 'You have spoken truly,' he replied: 'It is well finished. Now raise my head in your hands, for it would give me great joy to sit facing the holy place where I used to pray, so that I may sit and call on my Father.' And thus, on the floor of his cell, he chanted 'Glory be to the Father, and to the Son, and to the Holy Spirit' to its ending, and breathed his last. We may confidently believe that as he had devoted himself with such ardour to the praises of God here on earth, his soul was borne by the angels to the longed-for joys of Heaven. And all who saw and heard of the death of our father Bede declared that they had never known anyone end his days in such deep devotion and peace. Translated in A History of the English Church and People, trans. Leo Sherley-Price, rev. R. E. Latham (London, 1974), pp. 18-20 (paragraphs added). In Europe, the Ascension is the feast of summer skies. With Ælfric, who encourages us to 'behold the sun', we stand gazing into the heavens, which at this time of year are (sometimes) a glorious, fathomless blue; and like Christ at the Ascension, the sun climbs higher and higher in the sky as the solstice draws near. Birds, back for the summer, wheel and soar through the air. This week a flock of swifts have returned to the street where I live; in the long light evenings they swoop and swing through the sky, quicker than thought, sheer energy and life and unfettered freedom. 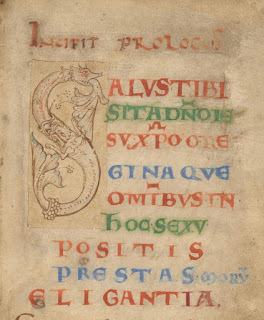 That's how this Anglo-Saxon poet imagined Christ.